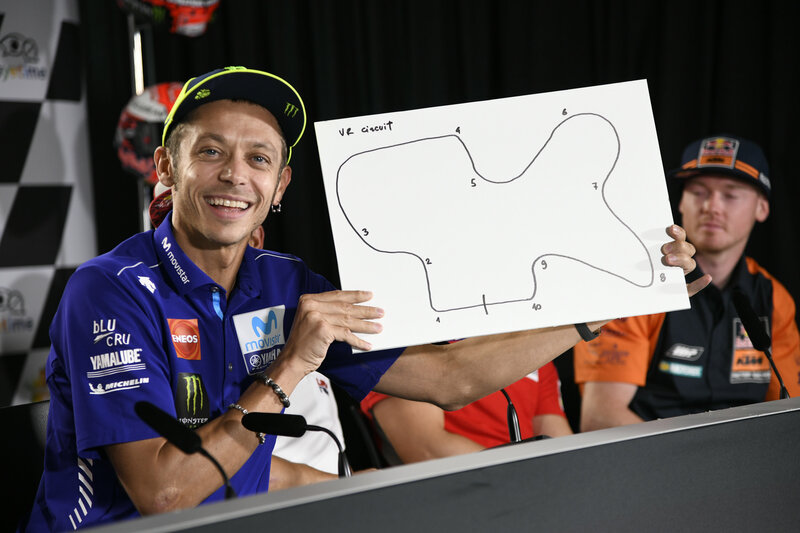 MotoGP riders draw dream circuits! Six riders draw their dream MotoGP circuits in Austria on Thursday. 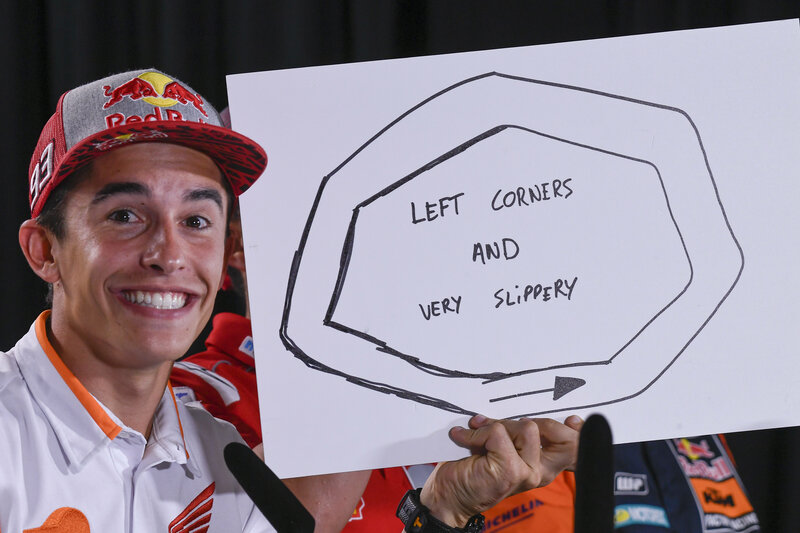 The pre-event press conference for the Austrian MotoGP saw Marc Marquez, Valentino Rossi, Jorge Lorenzo, Andrea Dovizioso, Bradley Smith and Miguel Oliveira asked to draw their dream circuits - and this is what they came up with (above). Smith had two goes after his first circuit design 'looked like a dog' but said it had no real meaning. Dovizioso was next to reveal and admitted his 'looked horrible... maybe it's 20 kilometres!' The only identifiable feature was a chicane from the old Salzburgring. Marquez (see below) went for a simple dirt-track style oval, made up of slippery left-handers! Rossi (see below), who conducted a similar exercise a year ago, opted for a combination of his favourite corners beginning with sections of Catalunya then Mugello and Phillip Island... but forgot how he wanted to end the lap! Lorenzo raised perhaps the biggest laugh when he revealed two circuit designs: The first, for this year's Ducati, was just a square - four straights and four 90-degree corners - to benefit from the Desmosedici's hard braking and acceleration! By contrast, he went for a continuous series of meandering corners for 2019, when he will be on a Repsol Honda. 2019 MotoGP rookie Oliveira drew an oval with left corners... then got distracted by all the nature near the Red Bull Ring and drew grass and sheep! MotoGP Austria - Friday LIVE!